The hike at the arboretum this morning was a lot of fun. An amazing number (approx. 150!) of people came. What a thrill it was to know so many people were willing to come out on a bea utiful fall day to see and learn about wildflowers! (especially since it was the day of the first UT football game under the new coach, Lane Kiffin!). One of our first stops was at the Pawpaw patch, where many participants sampled their first ripe pawpaw. (I didn't get a chance to write down the flowers, so now I'll see how good my memory is!) We saw many different flowers in one spot in the powerline cut, including the star of the show, the beautiful Blue Curls (left), White Heath Aster, Hoary Mountain Mint, Early Goldenrod, Pearly Everlasting, Rough Buttonweed, Narrow-leafed Mountain Mint, Hyssop-leaved Thoroughwort, and Great Lobelia. The Goldenrod got booed when I pointed it out, so I had to dispel a common misconception that it is a "bad guy"! I showed them the Common Ragweed (right) and explained that IT is the plant that is responsible for hayfever attacks this time of the year. 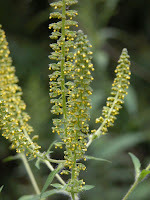 Goldenrod is insect pollinated, so it doesn't bother people, Ragweed is wind pollinated and dumps lots of sneeze-inducing pollen into the air. Ragweed does have one redeeming factor, it produces large, oil-rich seeds that birds eat in the late fall. Our next stop was a field that had been left to grow over the summer. It had several different flowers, including Tennessee's State Wildflower, the Passionflower (right). We also saw Queen Anne's Lace, Panicled Tick Trefoil, Small-leaved Tick Trefoil, Round-leaved Thoroughwort, Ironweed, Horse Nettle, Yellow Crownbeard, White Crownbeard, Butterfly Pea (some people snickered when they thought I meant "pee"! ), Field Bindweed, Butterfly Weed, Rose Pink, Hairy Hawkweed, Flowering Spurge, Weedy Rattlebox (left), Japanese Honeysuckle, Korean Clover, Prairie Golden Aster, Partridge Pea, Sensitive Pea and Wild Petunia. I sure hope I'm not covered in chigger bites tomorrow! I'm still suffering from my last walk over there! My back looks like a star chart of constellations with red welts! It is amazing how something so tiny (nearly microscopic) can make you itch so badly! Contrary to common belief, chiggers don't bury into you, they bite, feed and then drop off. They are the nymphs of a tiny mite that need a good protein meal (which our blood provides). They leave behind an anti-coagulant that causes the intense itching. I had met Mika, one of today's participants, during a spring wildflower hike at the arboretum. I had mentioned that I collect wildflower books from different areas. During a trip to Japan this summer she picked up a wildflower book in Japanese for me! Fortunately, the scientific names are written in a script that I can read! I now have books from Germany (in German), Norway (in Norwegian), South Africa (in English), and New Zealand. My son and his fiancee picked up a garden flower book on a trip to Japan, it is in English. I have looked in vain for wildflower books in Spanish on our trips to New Mexico and Texas, but I'll keep trying. I know Spanish-speaking people like wildflowers too! :) It is fun to see the different wildflowers that grow in other countries and compare the common names of many of our "weeds" with the foreign names. One of my favorites is the German name for Stork's Bill, it is Storchschnabel. That is fun to say! :) I was interested to learn that many of the South African wildflowers are ones that we use as annual bedding plants. It's kind of late for the comment, but I hope you liked the book!